"we came to Pinta Springs where I took a photograph". 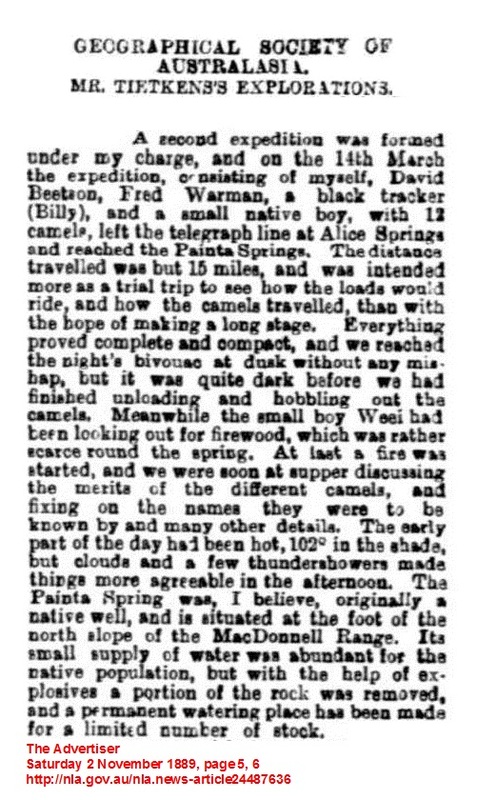 As the Thornycroft travels, about an hours drive north of Alice Springs and near the beginning of the track west to Archie Giles station and Illbila. The expedition halted here late afternoon of the 24th of July to check the loads and lashings on the trucks and Blakiston-Houston mentions that, "we came to Pinta Springs where I took a photograph of the members of the expedition", the Captain does not mention leaving his camera behind in the ensuring scramble to board the vehicles but he does note that it was intended to fill up with drinking water at this place, however as the going was good Blakeley chose to forego the refill and to push on to Giles Station, a regrettable decision. This decision was Blakeley's first test of bushcraft and common sense and he was found wanting, he ignored his own dictum of refilling the water containers at every opportunity, and the men had to survive for eight days until Dashwood Creek, on the muck available from Giles wells and waterholes, Blakeley's poor excuse for not taking on water at Pantas Well, "I was a bit shy of well water-very often it turned bad after a day or two", by all accounts this decision caused considerable dissension among the men. 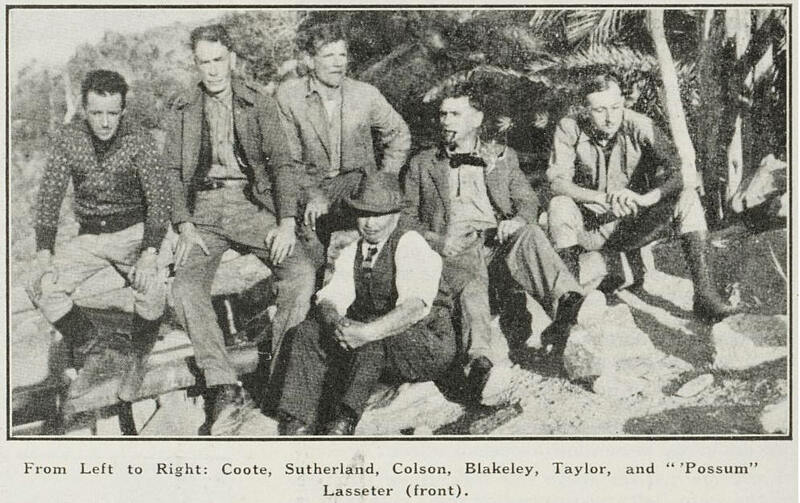 Blakeley had more pleasant memories of the place when he, Taylor and Sutherland camped there for the last night of the expedition on 27/9/30. A friend had given Sutherland a bottle of fifty year brandy for the journey, and it's contents were enjoyed that night at Palm Well, the Leader recorded, "it was just what we all wanted-we felt fine after it". There is an interesting note in the Lutheran Archives where one Robert Henry (Ted) Harris reckons that Pantas Well and Painter's Spring are one and the same, and that he camped with the expedition on night of the 24th and gave them a side of beef, neither the Captain, Coote or Blakeley mention this incident and it sounds a bit like Crombie showing the men of the expedition how to make damper, Coote mentions that the Captain left his camera at Pantas Well and it was returned by a carter named MacFarlane, Coote was moved to comment, "This is at least the land of honest white men". Blakeley Fred Dream Millions 13,161. Blakiston-Houston Memoirs 58. Coote E.H. Hell's Airport 73,74.